It seemed a long way to travel from Chiang Mai to Java’s ancient cultural capital of Jogjakarta to attend Indonesia’s annual Tourism Indonesia Mart & Expo (TIME) 2004 at the Jogja Expo Center recently. With all the challenges Indonesia has gone through in the past few years, the country managed to prove that tourism is a very resilient industry. Instead of being pessimistic, tourism stakeholders continue to show confidence. 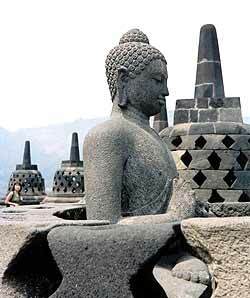 One of the 72 Buddha statues at the top of Borobudur near Jogjakarta. Because of tourism’s mission to foster peace, understanding, and friendship, the industry should be the first to stand in the front line and prove that the country is a safe and friendly place to visit. There is a new visa on arrival policy in place, and to pay USD 25 for thirty days stay in Indonesia is in line with other countries in Southeast Asia. H.E. Sri Sultan Hamengku Buwono X, Governor of Jogjakarta Special Province welcomed 148 sellers from 20 provinces, 112 buyers from 31 countries and 34 media delegates. He identified tourism as a key engine of economic development for the island of Java with more than 100 million people today. With the new Jogjakarta Tourism Development Board, the Sultan himself has taken a leading personal role as Ambassador for Jogjakarta to promote tourism and investment in the region. Among his top priorities was to have Jogjakarta’s airport designated as an international one with services to Singapore and Kuala Lumpur. 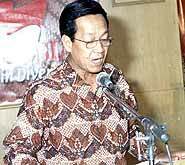 Sri Sultan Hamengku Buwono X, addressing the delegates of Royal Time 2004. In his keynote address to the one day international workshop on “Tourism Rebound”, the outgoing Minister of Culture and Tourism Gede Ardika noted that it is not war but travel, that counterbalances the effects of international terrorism. When tourists come to Indonesia, which is the fourth largest populated country in the world - made up of more than 17,000 islands - they are able to see how Buddhism, Hinduism, Islam and Christianity have all contributed over the centuries to Indonesia’s vibrant culture as well as its archaeological heritage. Indonesia is offering the world an “ultimate in diversity” of tourism attractions such as world heritage sites, cruising, yachting, beaches, adventure, and Eco-tourism. H.E. I Gede Ardika, minister for culture & tourism during a luncheon speech. In an emotional overview, Joop Ave, the former tourism minister of Indonesia, summed up Indonesia’s achievements under all the different presidents since the country’s independence on 17 August 1945. He is now counting on the charisma of the newly direct elected president Dr. Susilo Bambang Yudhoyono to bring back the hoped for continued material prosperity and to push tourism back on track. Highlights during Royal Time 2004 was an excellent arranged dinner at the 19th century-styled Rumah Sleman Private Boutique Hotel and an organized city tour to visit the “kraton” or sultan’s palace with the annexed “taman sari” or water castle in Jogjakarta. 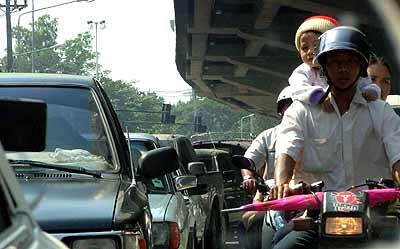 At the closing media conference it was stated that Jogjakarta will host Royal Time again on September 22-25, 2005. Before leaving Jogjakarta, I went on the 2 days/1 night Dieng historical tour that brought the eager participants to the world famous Borobudur Temple, built in the 8th century, long before Angkor Wat in Cambodia and on to the 2,000 meters high volcanic plateau of Dieng. There are active craters near a row of impressive ancient Hindu stone temples. After an overnight at the colonial-styled Gallery Kresna Wonosobo Hotel, we continued to the idyllic Losari Coffee Plantation Resort and Spa surrounded by eight volcanoes in the highlands of Central Java, a place from where it was really difficult to go back. Hopefully, in the near future, there will be a direct flight from Chiang Mai to Jogjakarta, the cultural heart of Indonesia. 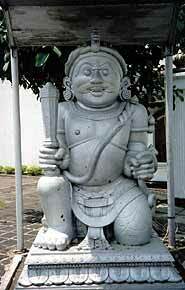 One of the fierce guardians to protect the Sultan’s palace. 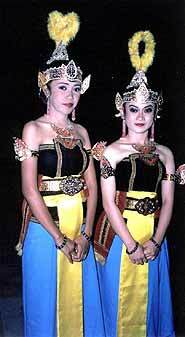 Two nicely dressed Ramayana ballet dancers. 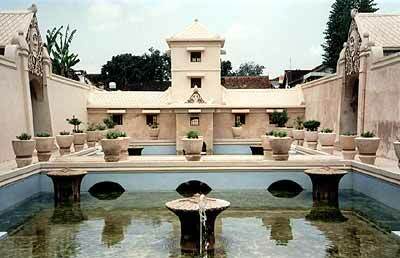 (Left) The newly renovated water castle in Jogjakarta. 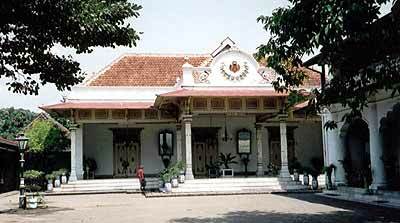 Residence of the Sultan and governor of Jogjakarta special province. 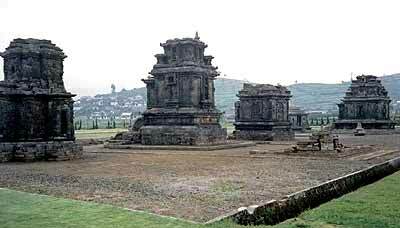 Ancient stone temples called “chandi” on the Dieng Plateau, Central Java. Several government and private organizations in Chiang Mai co-ordinated to celebrate the annual Children’s Day, which takes place each year on the second Saturday in January. This year, it fell on January 8. 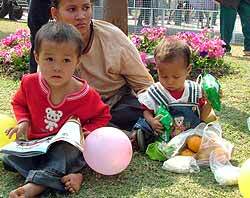 The slogan for Children’s Day suggested by PM Thaksin Shinawatra was the somewhat less than catchy “The new generation with a love of reading, studying, thinking and communicating”. 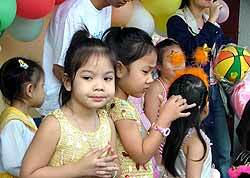 Children enjoy activities held around Chiang Mai on Children’s Day. The Chiang Mai Zoo attracted youthful visitors with the beloved panda couple, Lin Hui and Chuang Chuang, and the new one year old Bengal tigers, Kiew Kaew and Kiew Muk, who just flew in from Dusit Zoo in Bangkok. 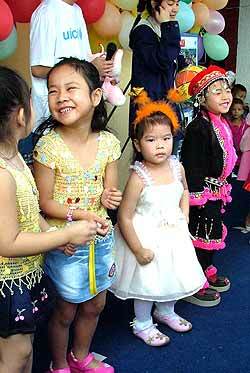 The eastern section of the Rajamangala Institute of Technology held students’ activities for children. The Kad Suan Kaew Department Store showed cartoons from Cartoon World to spark the children’s imagination. Parents and children enjoy the activities. Chiang Mai University (CMU) through the CMU-based FM 100 MHz arranged activities for the children at the Humanities Faculty. Another popular venue for children who dream of being pilots was the Air Force’s Wing 41 where many children had a chance to look over military aircraft; the military sniffer-dog show, a fly past and games were provided for children to win prizes and gifts. The main highlight of this year’s Children’s Day was the Asimo robot show. Honda’s Asimo was brought to Chiang Mai for display at the Central Airport Plaza. This show attracted many children. The Olympic medallists cheerfully answer the children’s questions. The Public Relations Department, Region 3 Office, including Channel 11 and the Chiang Mai-based Radio Thailand, held activities in front of the office. Painting and drawing on the 50 metres canvas reflected the children’s concern for the victims of the tsunami catastrophe in the six southern provinces. Three Olympic weightlifters, gold medallist Paweena Thongsuk and two bronze medallists, Aree Wiratthaworn and Wandee Kam-aiem, along with the president of the Weightlifting Association of Thailand, Major General Intarat Yodbangtoey, also participated in Children’s Day activities. They signed autographs and gave out New Year posters. They encouraged the children to achieve their goals with perseverance and to find their own inborn talents. The Lanna Dog Rescue team joined the Children’s Day activities at the Wat Suan Dok in tambon Suthep. This year’s Children’s Day provided a memorable experience for all children in Chiang Mai. Channel 11’s TV program production demonstration was packed with children who dream of being part of the TV scene. More enjoyment for the young people. 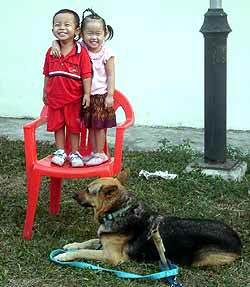 Two family members photographed with a dog from the Lanna Dog Rescue team. Children line up to get the signature of their weightlifting heroes. 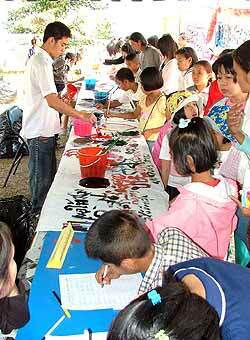 Children draw and paint to show their concern for the victims of the tsunami. Parents bring their children for the activities. 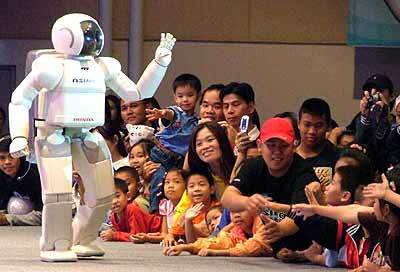 Intelligent robot Asimo added excitement to Chiang Mai.